Over the past few months, I have been getting so many requests and seeing searches for Naan in my blog, I am almost embarrassed to have taken so long to come up with the post. As in all cuisines, bread is an integral part of Indian cuisine. Naan, is a leavened oven baked flat bread, usually made in the northern regions of India, although it is known to be served in most Indian restaurants in the country and all over the world. Naan complements a main dish, but if you are like me, you can also eat it plain, indulgently patted over with ghee or butter. 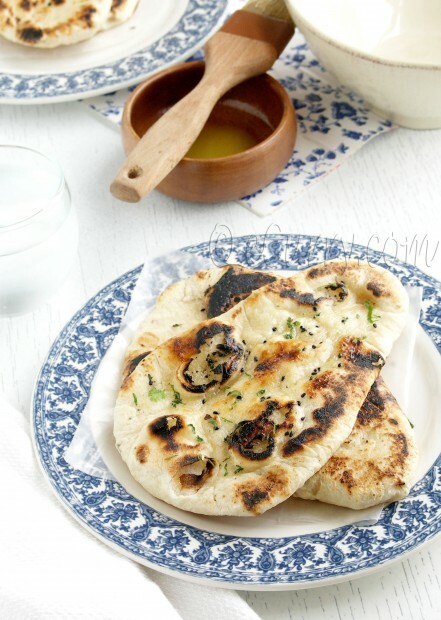 Naan may be made in different flavors; garlic, spices, herbs or whatever you can think of. They can also be stuffed with vegetable or meat. 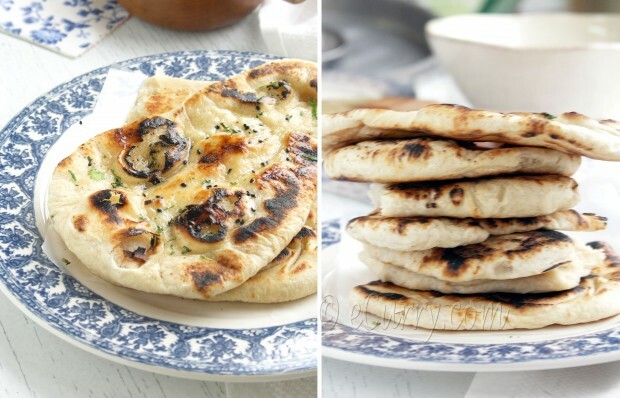 Once you get the hang of making a basic Naan, you can try out all the possibilities out there. There are numerous ways to enjoy them. Naan wraps/rolls, Naan pizza and Naan-wich have become quite popular in the contemporary fusion cuisine. Make some and find your own way to love them! This is a more traditional recipe of Naan with yeast. There are some versions using baking powder, but I have not tried that yet. The reason I had not posted the recipe for so long, is a valid one and I hope I will be forgiven by the ones who have walked away disappointed from this place. I wanted to share a recipe which I myself was satisfied with. So all these months I had been trying to perfect my skills. I had to work on a few bread making issues – the right texture of the Naan, inside and out, the traditional yeast bread feel and taste but without the obvious and (annoying to some) smell of yeast. And lastly since I do not own a Tandoor, the process needed to be perfected on the stove top or the oven getting it closest to the traditional taste. I have to admit that I use the stove top more than the oven. Personally I love the smoky aroma of the lightly spot charred Naan, which is obtained from roasting the bread directly on the fire. But the oven method works too, and might suit many. Please do not be intimidated by the long process. Once you read through it, you will see that it is quite simple. I have explained each step in details and have the skillet method, fire roasted kind and also cooked completely on the skillet and also the oven method. Since Naan is traditionally cooked in the Tandoor – a clay oven with extremely high temperature, Naan made at home usually do not have the authentic texture and look. But we will do our best here. The texture of the Naan should be lightly flaky crisp on the outside, almost brittle that the crust will break with the tiny pressure of the finger, but the bread itself will be soft, fluffy with nice flaky air pockets inside. It is delicate and slightly chewy at the same time. The Naan should no way get tough, brown and stiff like the edges of a pizza crust. Biting into this bread should be a pleasure, not be a jaw breaking, palate scraping experience. The cooking time is very important; it has to be well done, but overcooking it in the skillet or the oven will stiffen it making it crusty, which is not desirable. The timing will slightly vary from one oven to another, and also the thickness of the bread, flour etc. The perfection will come with practice. *Update: Adjust amount of water used to make the dough. If you are using Greek yogurt, it has less water content than the regular yogurt. Use as much or as little water to make smooth but pliable and non sticky dough. Dissolve the sugar in warm water (about 105 degree F). Add the dry yeast to the warm water and stir till the yeast is dissolved. Cover and leave aside for 10 minutes or until the mixture begins to froth and rise. This indicates the yeast is active. Set aside. Sift flour, salt and baking soda. Add yogurt, 5 tablespoon oil/ghee, and activated yeast to the flour. Use your fingers to mix all ingredients together till you can pull them into a soft dough. If you think you need more water, add a couple of tablespoons more, just enough to make a soft but NOT a sticky dough. Flour a flat surface like a large cutting board or kitchen counter and knead the dough till it is smooth and stretchy, for about 5 minutes. Place the dough in a lightly greased bowl, brush the surface of the dough with some oil, cover with a towel and set it aside in a warm place for it to rise for about 2-4 hours; it will doubles in volume. Punch the dough down, knead again for about 4 minutes, divide the dough into 8 parts (I usually slice it in triangles) and let it rise for another 30 – 45 minutes. Sprinkle the top of the Naan with spices or herbs or both, if you wish. gently press down with the rolling pin to make them stick to the dough. Brush the other side of the Naan with water. Heat a thick bottom skillet, preferably a good cast iron skillet/tawa, (or any kind of heavy bottom pan if you do not have an iron skillet). The skillet should be really hot. Place the Naan wet side down on the skillet and cover the skillet/pan with a lid. Reduce the heat a tiny bit and allow it to cook for 30-45 seconds. The underside will golden to light brown and the Naan will be easily released from the pan. 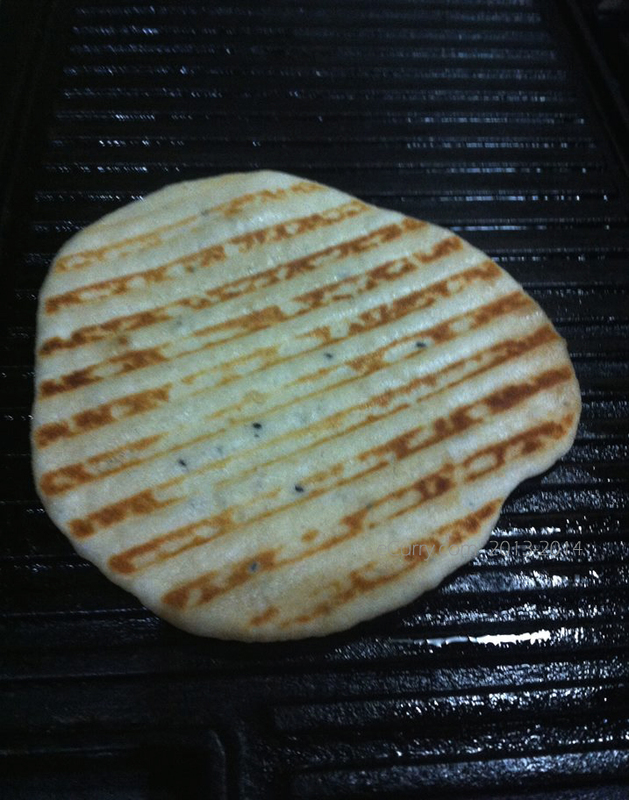 You will see big bubbles on the surface of the Naan. Reduce the heat to medium, uncover and cook for another 30 seconds. Remove the skillet from the cook the other side of the Naan over direct flame of the gas burner (bubble side facing the fire) with tongs. The Naan usually puffs up, and some spots will get charred (which imparts the lovely smoky flavor). Remove from heat and brush it generously with melted butter or ghee. I should mention here that the Naan baked on the pre heated pizza stone at very high temperature, comes closest to the Naan made in the tandoor. If you do not have a pizza stone, pre heat your baking tray in the oven while the oven is heating. Try to adjust the oven temperature between 400 – 450 degree F. The cooking time will also be needed to be adjusted as each oven works differently. Look for the color and how it puffs. Pre heat oven to 425 degree F. Place as many Naan as the stone/tray can hold with the wet side down. Cook the Naan for about 2 minutes; the top will be light golden and the Naan might start to puff. Flip the Naans over, cook for 2 minutes. If you want it lightly charred, set the oven to broil and cook till the top starts getting charred spots, for about 30 seconds to a minute. Remove Naan(s) from the oven and brush generously with ghee or melted butter. Stack them, and keep them covered in aluminium foil and wrap the package with a kitchen towel to keep them warm. Updated: If you want to make a pizza, sandwich with Naan or a wrap and would want some classic grill marks, use the stove top grill of the cast iron grill pan with ridges. Spray the grill lightly with oil, and heat until smoking. Roll the dough a bit thinner than you would for a regular naan. It makes it easier to fold or roll the naan. Pat one side of the rolled dough with water, as before and place the naan over the grill pan. In half a minute cover it and reduce the flame to medium. Leave it that way for a couple of minutes and uncover. Increase heat and allow it to cook until the naan is released. (You can actually flip it over with a spatula and make sure that the marks have formed). 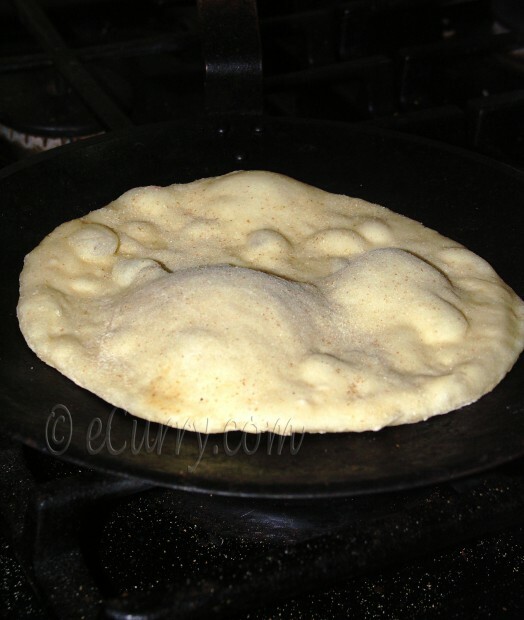 The naan will also bubble as it does on the skillet. Flip it over with the grill marks are prominent and light brown. Cook the other side on high heat until you see brown dots. If you want it charred like flame cooked, you may place this side (without grill marks) briefly on the flame. But it is not required especially if you are rolling it up to use for wraps and sandwich. The naan would have puffed a bit even though unevenly. Serve hot with meals. They are great to scoop and mop off curies and food with sauce. (Here is a list of curries you can use to have the Naan with). Or serve with grilled meat and vegetables. 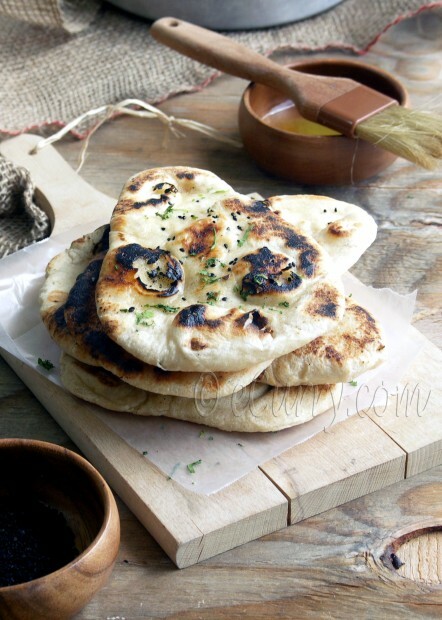 We love to have Naan with Hummus or any similar condiment. Go ahead, use your creativity to use the Naan in many unique ways! To store the Naans, wrap them in foil and refrigerate them. Reheat in the oven wrapped in foil. I made one vegan kind recently but it did not turn out like the vegetarian one. Must try with cashew yogurt. Yours are perfect – in shape, texture and looks!! Well done, Soma:). Harini, I am wondering if you could use soft tofu. I have never used it, but have heard that dough made with tofu comes out really soft. Not sure of the flavor tho’.Or use no yogurt at all and increase the amount of yeast. i make the pocket pitas which puffs wonderfully, and the recipe has more yeast than this Naan.They are really good and almost like Naan, except they might be a little more crispy on the outside (not hard and crusty tho’) and may be a little less stretchy. 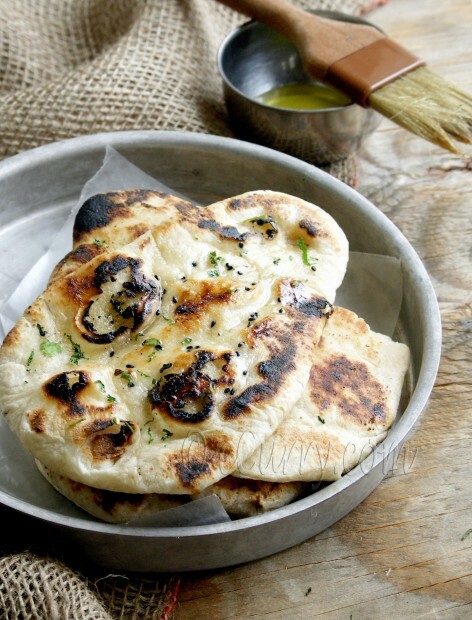 Yeast Naans are much better than the bakiing soda ones, and yours look just the right. I have a charcoal ‘sigdi’ which is used only for manking htese Naans and Batis 🙂 The aroma of burnt charcoal on these delicacies is heavenly. I envy u 🙁 U have a sigdi! Those naans look absolutely delectable ! Make me want to grab one of them ! 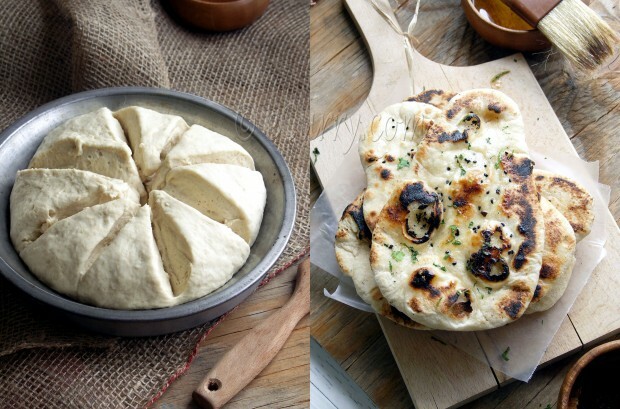 naans looks perfect,..and the pics are too good,..
Those are splendid naans! 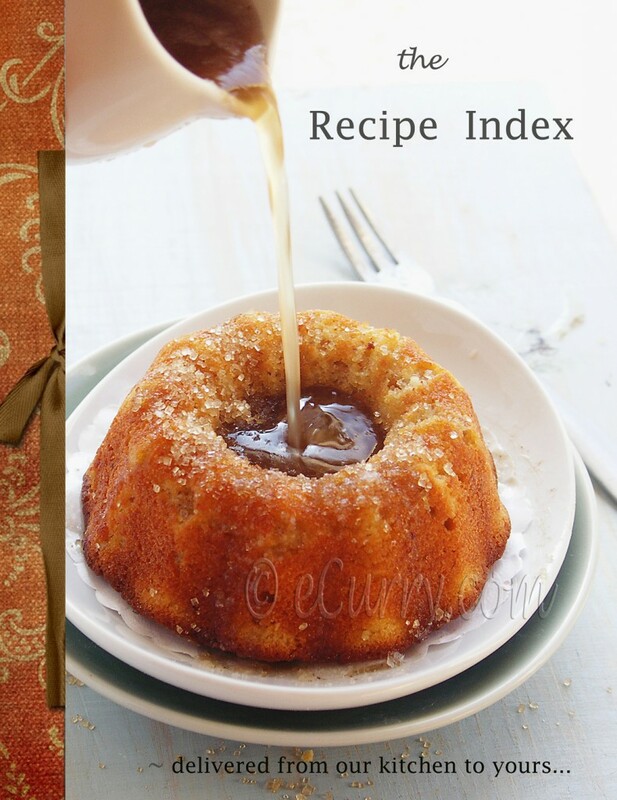 I am bookmarking your recipe. Awesome, I am glad you posted this recipe..Can’t wait to try this..thanks for sharing! Ooh, they look amazing! I’ll definitely be giving the recipe a go. When I make curries at home I always have to do without naan because they stuff they sell in the shops is just terrible, so I only get my naan fix when I eat out at Indian restaurants. Hi Soma, All the versions of naans are looking AWESOME…. ! Its looking so good in texture and color, loved the charred black spots and am sure you guys had a great time savoring all of them. Its a perfect treat at home to satiate the hungry soul with perfect home made naans with butter, nothing more can be more scrumptious….have a great day, tc !!!!! Perfect homemade Naan. I am yet to practice the perfect Naan without the yeast. 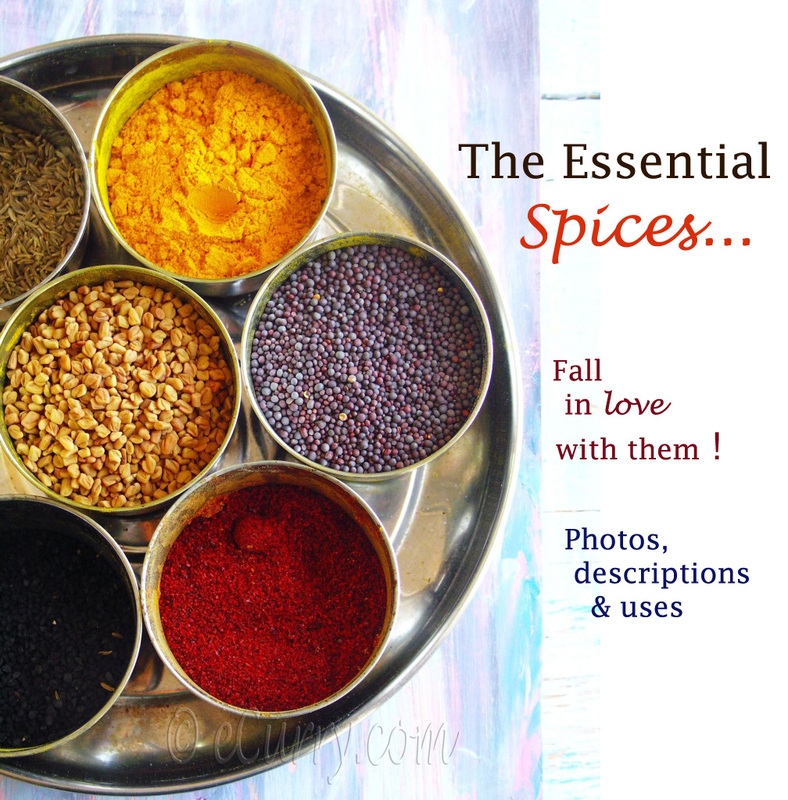 Sometimes the same recipe disappoints but there is an easy option of getting them from stores and I opt for that. O these look so good! I think I might have been one of the people searching for naan on your website as I have been looking for a good recipe to try them at home. I think I’m gonna try out the oven method as that seems the most likely to succeed in my kitchen… 🙂 I will let you know how it goes! Your naan looks so delicious! I wish I could grab a piece off the screen. I’ve never tried making it, but now I definitely want to! Thank you, Thank you, Thank you! I’ve been wanting to make this for a long time. Now I can…. Of course, I’m going to have to try and wait until after passover when I can have flour in my house again. Hmn… I wonder if I could sneak some time in before I finish kashering the kitchen? I’m not sure if I can wait. O gosh your nan looks so gorgeous and very tempting. Clicks a indeed super.I don’t mind to have one or two piece right now for our dinner.yum..Bookmarked. 2. When I make it in the oven, do i need to brush the pan with oil ? use any oil or ghee, doesn’t matter. Since I wet one side of the Naan I do not grease the baking tray. Oye Soma been waiting for this post for a while! LOOKS so gooood! We use similar recipes and are we soul sisters? Even though I tried pizza stone, oven and all that but I still prefer naan on stove for various reasons. I can have more control over how long I cook the naan and it also lends to slightly softer naan than in oven . Great post! The charred look makes me think of tandoor oven! U ve done it beautifully! Lovely. And the images too were sooo tasty 😛 Loved the post. Thanks! I love all the different versions you gave us…brilliant that it can be done in the oven! I can’t wait to try this and compare it to my much loved Trader Joe’s version. I appreciate the comment you made on my asparagus photo. 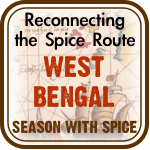 We are great fans of Indian style cooking and apply many of the techniques and flavors into our own meals. You have been bookmarked and will be visited often. Absolutely Khandani !!! very well explained !! yummy naans! love the kadai! Awesome post! Naan looks heavenly. I have not seen such a great looking naan in a very long time. Wow, love your tawa. Exactly like my mom’s. I remember discussing yeasted Indian breads on twitter & telling you I have never made yeasted Indian bread only plain like bahkri, puri and puren poli. Now I got a great excuse to make them for the first time since I got your recipe!! Beautiful pics as always!! Thank you Shobha. About the camera: No, no prime lens:) I do not have or use a DSLR. This is my Camera Konica Minolta It is a very old camera, and it is better than a P&S. It has some good features, but I take pictures in the AUTO mode, which is actually as good as P&S 🙂 Have no idea about the f or aperture, etc.. I can control some amount of light and spot focus in the Auto mode in this camera. What an amazingly in depth description and wha lovely photos. I am so glad you discovered my blog and commented so I could find yours. I really have to try making this. This looks so much better than any from the store. I like to eat it with tzatziki. Have you found any zucchini/squash/pumpkin blossoms in Dallas/Fort Worth? I wanted to fry up some kumro phul but dont know where to find any. Last time I made naan, it was more like the pizza crust texture you described. I am going to have to try your recipe. thank you for this wonderful recipe and instructions. You are demystifying indian cuisine for me. I love naan bread and this looks gorgeous. I’ve been looking for a good naan recipe–though the one I did find (and try) is similar to yours I love that you’ve included the cooking instructions in such detail. And your pictures are simply mouth watering! Drool! I don’t think there is anything better than fresh naan. This looks absolutely delicious Soma. I love the detailed instructions you’ve provided. I have bookmarked this for the day I feel adventurous enough to make my own naan. 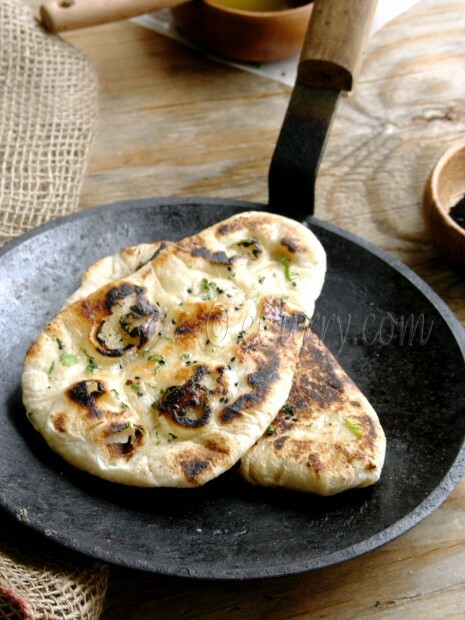 Skillet with naan picture is a killer….i seriously adore naan but since it involves time and patience it get ruled out most of the time in my kitchen! I haven’t made naan bread in so long. You made me remember! 😉 I think in the near future we’re gonna have a curry and naan bread night! I’m so excited about this recipe. Any suggestions for substituting whole wheat flour? You can use half all purpose and half whole wheat (preferably whole wheat pastry flour). Using all whole wheat makes the bread dense. It will still work, but will lack the fluffy airy feel and the slight stretch that is so wanted in a naan. Also, using whole wheat might need you to add more liquid; I would suggest using more yogurt or whey instead of water. Soma, I always admired your photography skills and this recipe with such beautiful pics almost makes me gasp for breath! I was asking on FB for a ‘good’ naan recipe and it’s Finla who told me about it. I’m going to try this and shall let you know 🙂 Thanks! I tried this last night since I was making Indian food for supper. It’s really good and definitely the best naan recipe I’ve tried. I used the skillet method but plan to try the oven method the next time I make it. Thanks for posting this! I am familiar with Naan, have eaten it (yum!) but have never made it. Thanks so much for the recipe, I look forward to the challenge of trying to get it *just* right! i am so, so excited for this recipe. i grew up under the care of an incredible nanny from Kolkata, and she made an absolutely beautiful naan. i watched her make it time and time again, but her measurements were vague to say the least 🙂 during a recent phonecall when i asked her once more for the recipe, she suggested coyly that i come home to visit her and try it out… Australia to the US, not something i could quite do right away. now i have your recipe, and i’m beyond happy to try it out. This is a great recipe. Straight to the kitchen now to give it a try. Much cheaper to make than to buy. OMG! I have to say I saw the pics and gave this a shot. I always have trouble with yeast and dough but this was amazing! It was the unstoppable rising dough. I did it in a cast iron skillet abd it was amazing. delicious, soft with a nice crunch on the outside. Thank you! Its a keeper! Any brand plain unflavored yogurt may be used. have updated the post. Hope this helps. 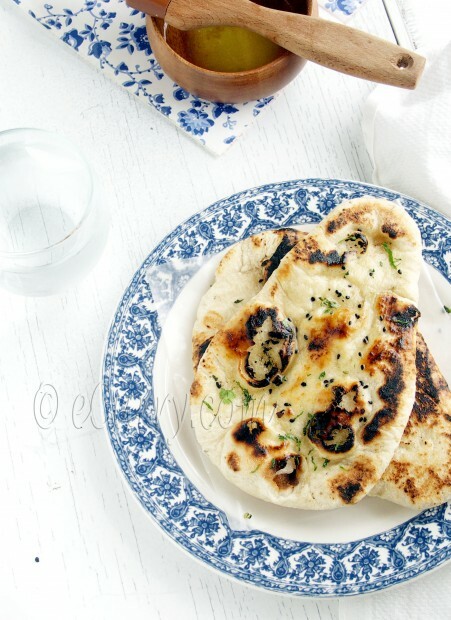 I saw this on pintrest and HAD to click through – I made a naan a few weeks ago that was absolutely divine it tasted just like the “real thing” however, silly me, I didn’t save the recipe! I’ve made three recipes since and none of them come close! 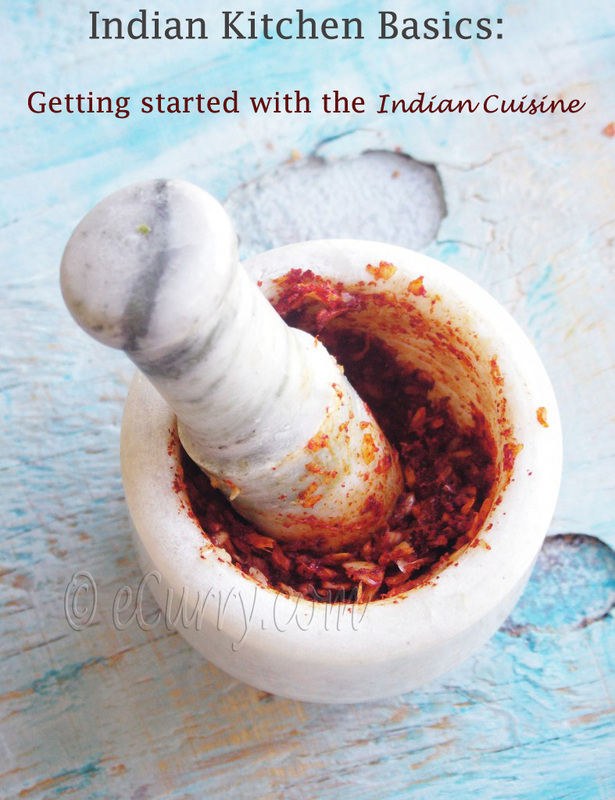 I’m bookmarking this and hope it ends my quests for naan recipes! 🙂 I hope you like it, and I hope you get to try it sometime! I don’t know what happened. My dough was MUCH too dry. I had to add 1.5 cups of extra water to get it into a dough. Hmmmmm.. I am not sure. However as long as you got a dough smooth and soft, it should be okay. Often times the flour or even how much water is there in the yogurt would make a difference. I did say in the recipe that it would need a little bit of extra water. Another one here who came across your site and naan recipe through Pinterest. I’ve been wanting to make homemade naan forever. As a matter of fact, last year I went out and bought some ghee and some Durum Atta flour because I saw a recipe on another site which required this type of flour. I’ve kept the these products well sealed and protected, but never found the courage to make it, and lost the original recipe site. Since you encouraged me, and told me not to be afraid of all the steps, I’ve decided to try my hand and hope for as nice of a result as your pictures. Those look amazingly delicious! And besides, I like that your recipe calls for yogurt which I don’t recall the other one asking for. Yours sounds so much better! I KNEW there was a reason I was waiting to make it lol! I do have a question though. I’d like to use up this Durum Atta flour, so are there any steps I should take differently? Keep calm and naan on. | Wait…are those…cookies?! Loved this recipe! I made them yesterday, the stove method. I also used a baking sheet since I don’t have a stone. The only thing was they didn’t seem to cook enough after 2 min on each side, even turned it up to 450! I didn’t get those pretty bubbles like in yours they just looked flat, not sure what I did wrong! I made this a few weeks back and have been meaning to leave a comment to thank you for the recipe. The naan were absolutely amazing – soft and buttery and delicious. Thank you! and am glad that it worked out and you liked it! Love eating Naan with Tandoori Chicken at our local Indian restaurants. I didn’t know that we could get Naan made without a tandoor. This is good news for me. My fave is cheese or garlic Naan. Probably I should try making my own Naan at home. I have mastered making Tandoori Chicken by roasting it in an oven. Yummy…home-made Naan and Tandoori Chicken! Hi there, this is a fabulous find! My daughter will eat her weight in Naan and I was wondering if a dutch oven would work? I bake rustic breads regularly in mine and it “crisps” quite well. Frankly speaking, I do not know! I have never used a Dutch oven in my life, but cook mine on the stove top on a cast iron skillet. Why not give it a try? If you do please let me know!! Yummy. I too love the smoky holes. I often make tandoori roti with plain atta using the same method as yours. Will have to try the yeast dough now. i cannt believe this i can prepare this at home i tried so many time and it went wrong . but this time i followed ur recipe and it was perfect. The last 2 times i made this the dough was really really tough…is greek yogurt a no no? that’s all i can think of that would be messing it up! The pictures look amazing and just like naan at restaurants so i don’t want to give up on this recipe! The Greek Yogurt should not be a no no at all. The amount of liquid/yogurt I have written down here is adjustable. Often the type/brand of flour might also make a difference. If you feel the dough is too tight, use a bit more water/yogurt to loosen it up. It won’t harm the dough at all!! 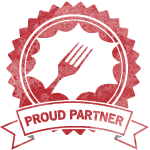 THANK YOU for posting detailed descriptions of the different ways to cook it! I’ve been searching for oven settings and this is perfect. I have been using a variation of this recipe for ages – I don’t add yogurt or baking soda, and use dried yeast. My family love naan, but no matter how many “spare” I make for the next day, they never last through the night. We are moving to a home with gas stove soon, can’t wait to turn from skillet straight onto flame. Exciting!!! I have been trying naan and I must say that I have been having moderate sucess. What i have NOT done is allow it to rise a second time…I didnt see that anywhere. That could be it. Shall be my sunday project!!! Thanks Soma. Made this to accompany a curry and they turned out really well but I didn’t have the right kind of pan to cook them. They either stuck or I needed to spray oil to stop this – I used two different types of pan to no avail. However, this really didn’t affect the naan (just made me irritated) and I’d definitely make it again. Thank you! Really delicious. Thank you for that recipe 🙂 Will have it tonight with my vegetable curry. Perfect Naan and made in a tava, I am pinning this.